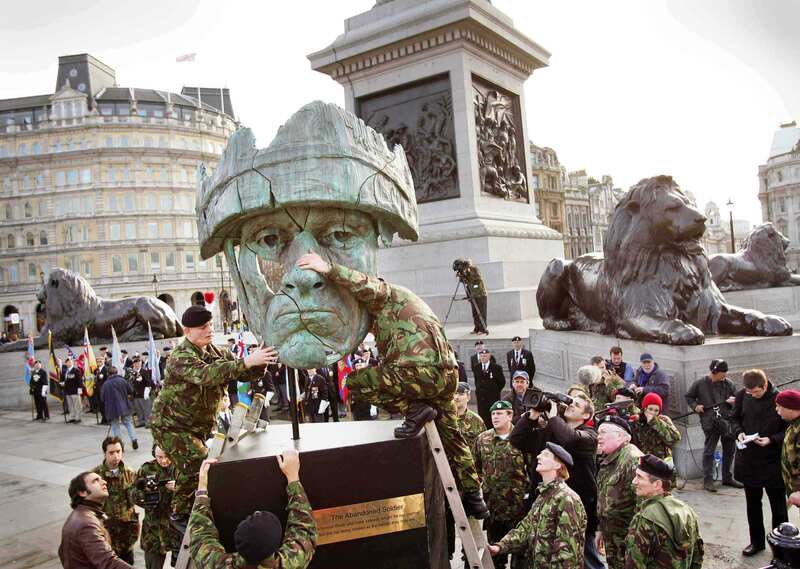 The "Abandoned Soldier" (TAS) statue, modeled on the face of a British ex-soldier Daniel Twiddy, was originally created for a 2007 BBC TV program made by journalist Tim Samuels. This was part of a 3-part series 'Power to the People', which aimed to give a voice to various disenfranchised groups. The program "The Battle of Trafalgar Square" saw a "platoon" of ex-servicemen, many with shocking and moving stories to tell, install the striking sculpture in front of Nelson's Column. After the program, TAS made an appearance on Newsnight and the front page of the Independent newspaper. TAS was found a home at Combat Stress's Tyrwhitt House, but this was short-lived and TAS returned to James Napier's London Art Studio where it remained until plans to find it a permanent home and raise awareness were re-ignited, when Welsh ex service man and Poet Mark Christmas approached James to ask if he could use the image for his book of poetry, also called The Abandoned Soldier. Mark and James decided that it was time TAS came out of the cellar and planned its move to the National Memorial Arboretum (NMA) in Staffordshire in time for the book launch. Since it arrived at the NMA the project has been tirelessly raising awareness of the statue and what it represents. It has appeared in the Independent On Sunday, Central News and various radio programs to name but a few. TAS moved to the Firing Line Museum of The Welsh Soldier at Cardiff Castle and it was hoped to go to Edinburgh Castle. Sadly this was not possible and TAS headed to The War Art Exhibition at Exeter Castle before continuing his journey to Rhondda Heritage Park in support of Welsh soldiers from all generations living with the effects of war. Currently TAS is heading back to his semi permanent home at Cardiff Castle. We are uncertain of TAS's next home but we are determined to keep TAS out of the cellar! The project also has a growing number of supporters with over 1,000 on it's Facebook group. Among supporters is Major-Gen Tim Cross CBE, who recently came out in support of the campaign, saying: "The Abandoned Soldier Project is a wonderful example of a determination by those who do care to do something about those who desperately need hope, love and restoration. I commend it unreservedly."